The space in front of the Slovak National Museum is made beautiful by the monumental memorial of the Czechoslovak state. It was solemnly dedicated on 28th October 1988. It is composed of a nearly 15 m tall column with a bronze lion placed on its top. The lion supports the state emblem of the former Czechoslovakia. The lion is 4 m tall and 5.5 m long. It was originally part of a different monument which used to stand in the nearby Námestie Ľudovíta Štúra square. Originally it did honour to the great Slovak scientist and politician Milan Rastislav Štefánik. 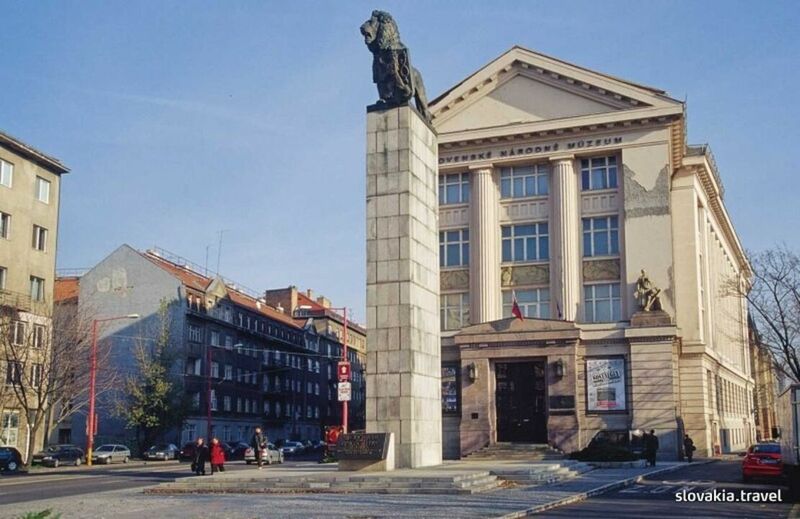 It is said that when the fascist Germany invaded Petržalka in Bratislava, the lion on the column could be clearly seen from the opposite riverbank. Adolf Hitler beheld it, too and he uttered these words: “That cat must go away!” The lion was really taken off the column and put away in the barracks until it appeared on this memorial.